KINGSTON, Jamaica (AFP) – The roadway along which the world's fastest man Usain Bolt crashed his car a few months ago will be renamed in his honor. Jamaican Prime Minister Bruce Golding told Parliament on Tuesday that Highway 2000 would be called the Usain Bolt Highway. The road connects the capital of Kingston in the east with Montego Bay in the far west of the country. Only three Jamaican prime ministers - Sir Alexander Bustamante, Norman Manley, Michael Manley have had highways named after them. Olympians Herb McKenley and Arthur Wint have also had roads named after them. In Parliament Tuedsay, Prime Minister Golding said Bolt's "endearing personality, charisma and passion for his country make him a superb ambassador of Jamaica." He also announced that the country's fourth highest honour -- the Order of Jamaica, will be conferred on the 23-year-old sprinter. 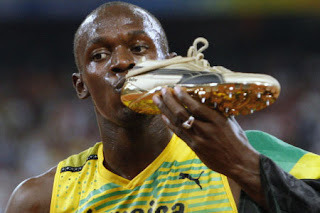 Bolt will become the youngest person to receive such award. Bolt will also be appointed an Ambassador-at-Large and will be accorded full diplomatic status. In April, Bolt suffered minor injuries in a car smash on Highway 2000.